Find every knife you need, from the sharpest paring knives and steak knives to rugged hunting knives and pocket knives. 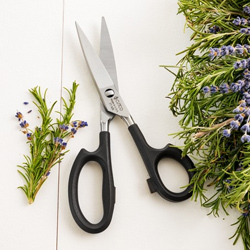 Made from quality materials and handcrafted by cutlery experts, these will be the knives you depend on everyday in the kitchen, at the table and outdoors. 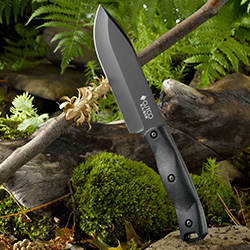 All Cutco knives are American made. A series of recessed cutting edges makes smooth, even cuts forward, backward and straight down; unlike serrated edges that rip and tear food. Beautiful mirror-polished and hollow-ground blades make easy work of any task. Food falls away effortlessly as you slice. 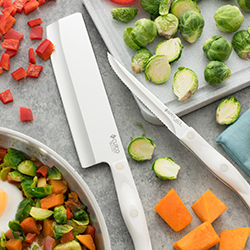 High-carbon stainless steel blades are heat treated to make every knife strong, flexible and durable. 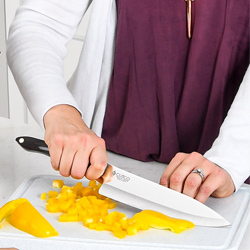 Ergonomically-designed knife handles fit naturally in your hand. 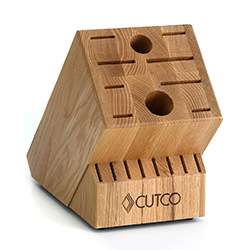 The perfect balance and solid construction help make knives comfortable to hold and safe to use. The blade extends the full length of the handle making the knife durable and well balanced. An important 3-step heating and cooling process that transforms the steel. Once complete the blade is flexible, durable and able to hold a sharp edge. Three nickel silver rivets connect the handle to the steel, providing a tight seal to prevent food from becoming trapped. 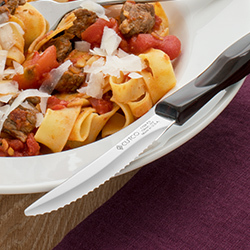 High-carbon stainless steel allows the knives to hold a sharp edge and resist corrosion.